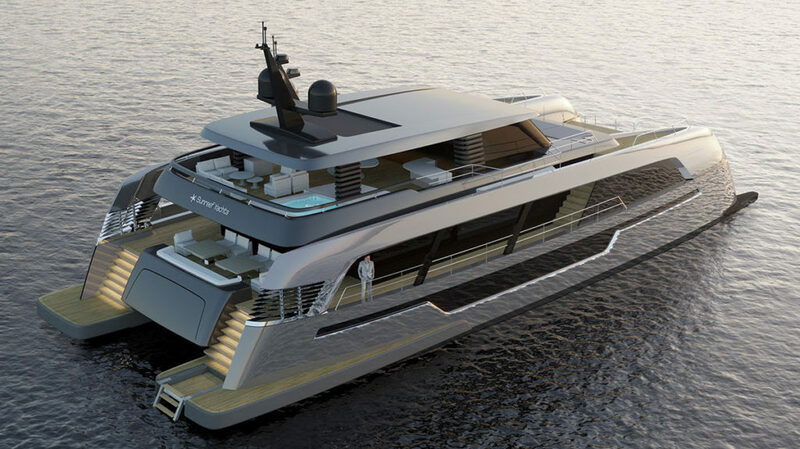 Sunreef Yachts proudly unveils the shipyard’s latest superyacht concept – the 120 Sunreef Power. A daring, aerodynamic design stretching living spaces to the extreme and opening new possibilities for worldwide cruising in ultimate luxury. With her reversed bow, increased hull width and generous glazing, the 120 Sunreef Power is a custom craft designed for bold contemporary yacht owners valuing strength and originality. 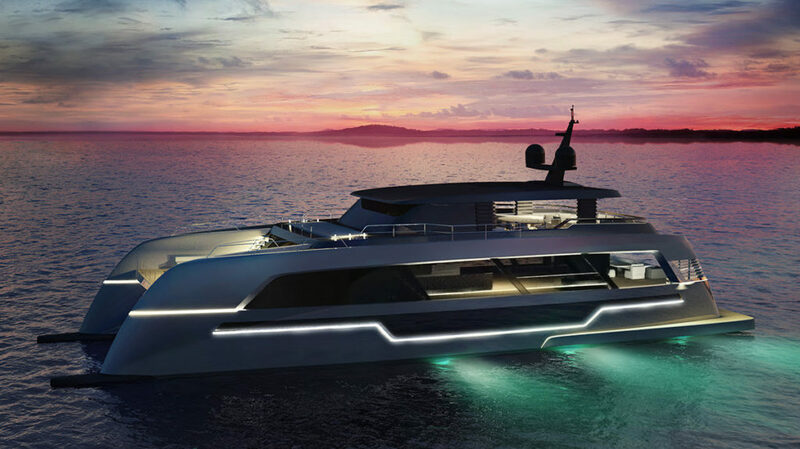 With a growing interest for multihull concepts in the superyacht segment, the shipyard’s in-house design team has elaborated a monumental, yet dynamic catamaran model. Inspired by the supercar industry, the lines of the 120 Sunreef Power are both elegant and sporty with numerous chrome elements and LED accents. The 120 Sunreef Power offers full freedom in terms of décor and space arrangement. The first layout proposition includes accommodation for 8 guests and 8 crew. On main deck level, three sliding doors open the saloon onto the sides and the aft dining space to create a vast open-air lounge. The oversized modular sofas are the central point of the social area equipped with a 110″ TV, interactive screens and premium sound system. The dining table for 10 is conveniently placed closer to the galley to ease service. Further towards the bow, the master suite makes the best possible use of the yacht’s immense 14.4m beam, offering a walk-in dressing room, vast master bathroom and direct access to a private terrace. Starboard off the main deck, guests find a peaceful retreat in the three luxuriously appointed en-suite cabins. The main crew area is located in the portside hull, featuring comfortable accommodation for 7 along with a spacious mess. From there, a staircase leads directly to the yacht’s galley. With an efficient layout and clever storage solutions, the space is designed to facilitate workflow and deliver high-end restaurant service. The captain’s quarters and helm station are both placed on flybridge level to offer the best visibility. Towering over the main deck, the flybridge is the yacht’s main alfresco lounging and dining area featuring a bar, spa-pool, free-standing furniture and plenty of room for massage beds and gym gear. To the aft, two transformer platforms serve both as passerelles and swim ladders. The yacht’s ample garage holds the tender, jet-ski and wide selection of water toys. 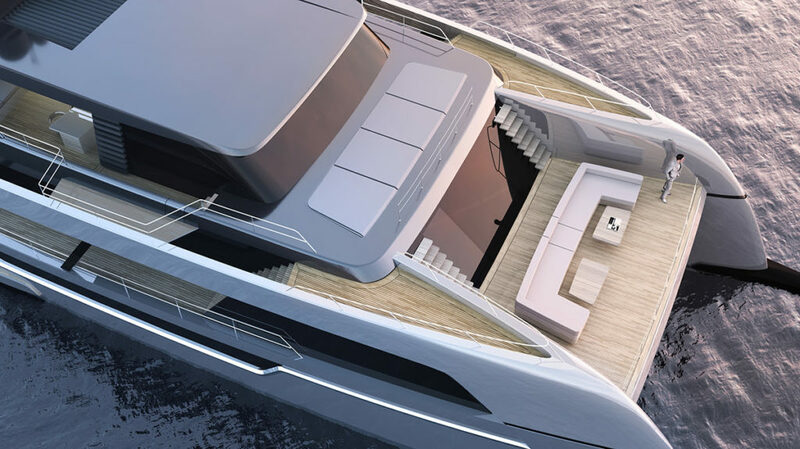 More information about the shipyard’s latest superyacht concept will be made available at the upcoming 2019 boat shows.